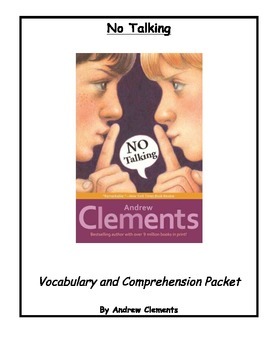 This is a complete guide for students to use while reading No Talking by Andrew Clements. Guide includes both vocabulary and comprehension questions for every chapter. Shorter chapters may be combined (see preview). Each page includes 1-3 vocabulary words for each chapter. The word is first given in a sample sentence, then given in the context as used in the book. Directions for the students are listed as follows: 1. Highlight the underlined words. 2. 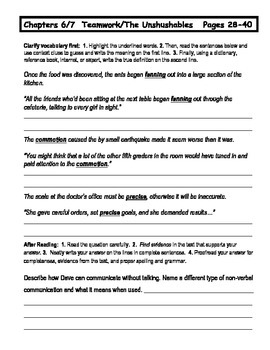 Read the sentences below and use context clues to guess and write the meaning on the first line. 3. Finally, check in a dictionary or on the internet and write the definitions on the second line below. 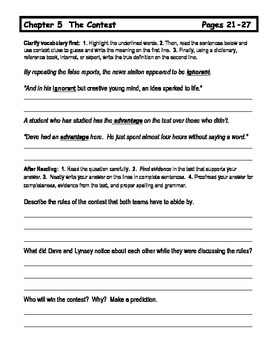 1-6 comprehension questions in many forms (factual, analytic, inferential) are included for each chapter. Great companion for your students' reading of No Talking. Used this year in my fifth grade guided reading group.